Frames as shown: (top) 5x7 off-center, centered, off-center; (bottom) 8x10 off-center and centered. Create a dramatic display with Manhattan Box frames. Hand-welded in a family-owned metalworking shop in Minnesota, these frames are large in scale and add sculptural dimension to a room. To create the distinctive patina, steel is dipped in a solution that reveals natural variations in color and texture, giving the frames a weathered appearance. This means no two frames are exactly alike. 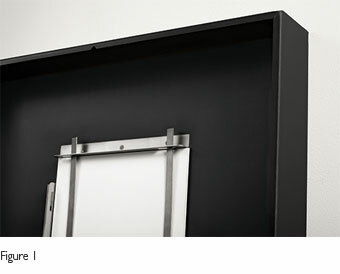 Manhattan Box frames are designed to be hung vertically or horizontally. Stunning when used solo, they also look striking when mounted as part of a wall gallery.